Two automotive icons, one V8 powered the other V6, one a record holder the other harking back to its legendary predecessor. On the face of it they seem to be a rather strange comparison but perhaps we’re not quite as bonkers as you think. What’s the main similarity? Bonhams will auction both at their Zoute sale in Knokk-Le Zoute, Belgium, in October, and both are expected to go for a similar amount… So, as we’ve done before, we thought we would weigh up the benefits of these two, equally as iconic, supercars. Let’s start with the XJ220. The story of the super-Jag is well told. Originally expected to come with a monstrous V12, the takeover of Jaguar by Ford stifled the development rather. By the time the XJ220 was released to an expectant public, the impressive power-unit was replaced by a slightly less mighty, but still track-developed, 3.5-litre V6. Also out went the innovative four-wheel-drive system of the original concept, displayed to a stunned public at the UK Motor Show in 1988. By the time the XJ220 finally entered production in 1992, the world was in a recession. That engine, previously seen in the Le Mans racing XJR-11, but also the rather less glamorous MG Metro 6R4, and other revisions were a great excuse for cash-strapped investors to pull out. Barely a fifth of the 1,500 original orders were delivered. However all was not lost. Despite the revisions the XJ220 was still able to pass its original 300kph target. Martin Brundle took the finished XJ220 to a top speed of 217.1mph at the Nardo test ring – thus making it the fastest car in the world. The Ford GT on the other hand can’t lay claim any extreme top speed numbers, being limited to, an admittedly still rapid, 205mph electronically. 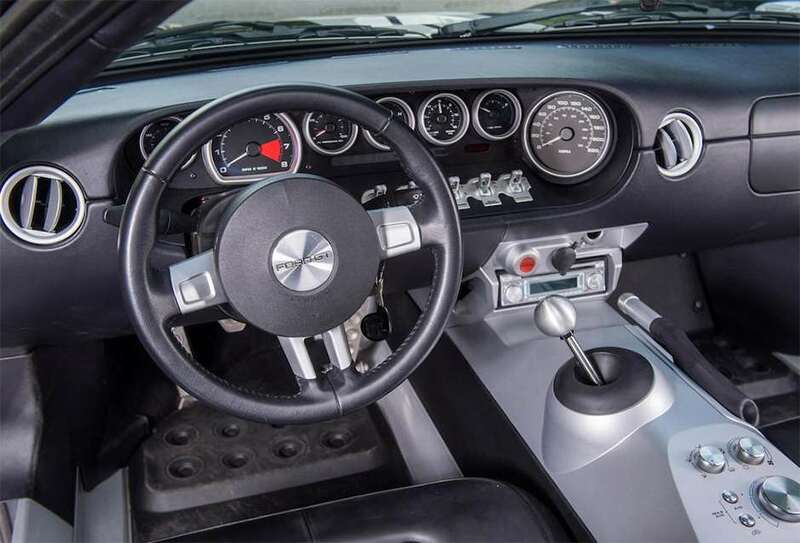 The GT instead trades on its looks, being an, albeit enlarged, near carbon-copy of the iconic Le Mans winning GT40. Under the ‘hood’ is a traditional Amercian V8, this time in supercharged, 5.4-litre form, pumping out 550bhp and 500lb ft of torque. 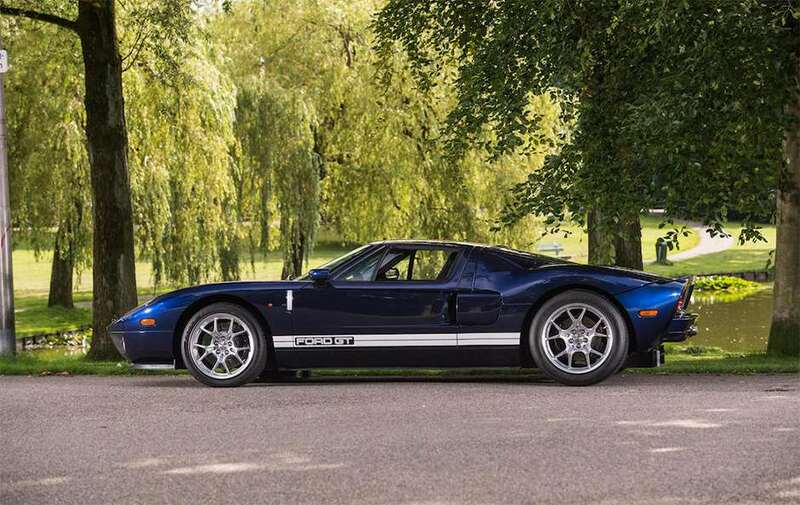 Only 101 of the 4,000-plus GTs made their way across the pond, and were immediately snapped up by celebrities and collectors including (now ex) Top Gear presenter Jeremy Clarkson. So, despite a 13 year age difference, the XJ220 has the GT licked on power and top speed. And, if the estimates are correct, stands a chance of coming in slightly under the GT when the hammer falls. The experts at Bonhams reckon the Jaguar can fetch anything between €280,000 and €420,000 while the GT is set at €300-400,000. As for the individual cars seen here. 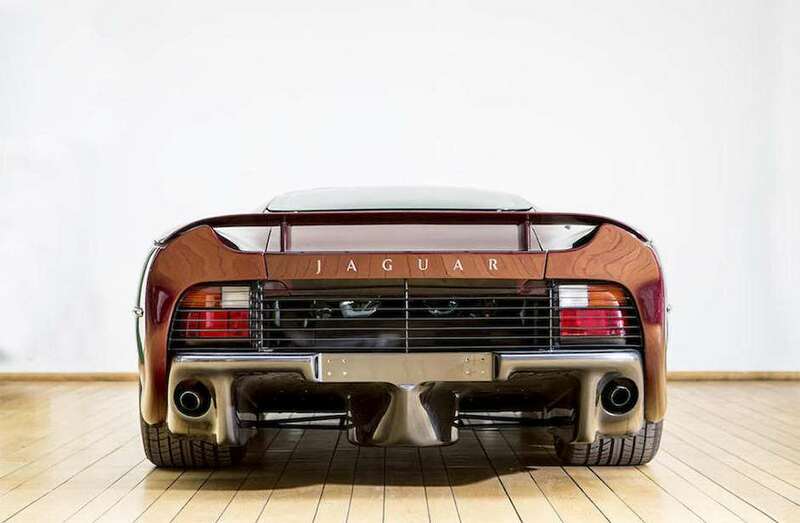 The XJ220 is a left-hand-drive model, in Burgandy and its early chassis number (874, meaning it was 33rd off the line) Bonhams say means it is a ‘highly desirable’ edition. It was delivered in December 1992 to a Jaguar dealer in Belgium, but sat idle and unregistered until September 1997 when it was handed the Belgian plate ‘JAG 181’. 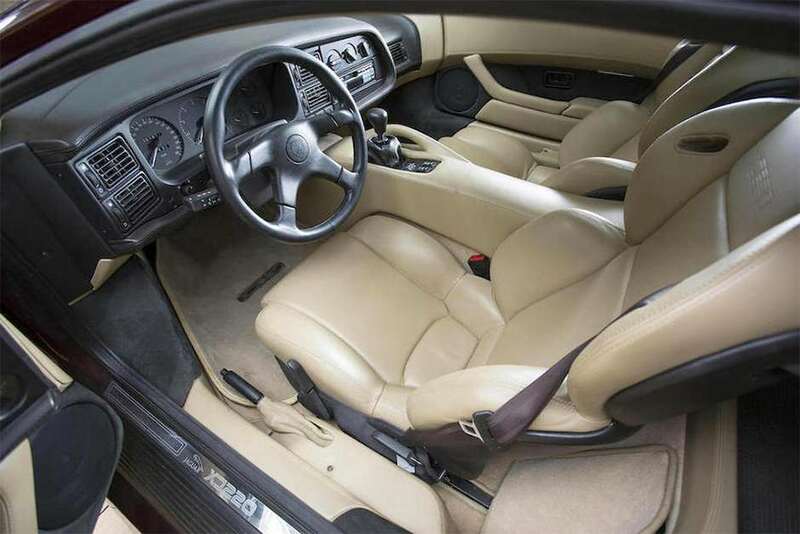 Since then it has been used sparingly, mostly living as a showroom flagship, and has covered just 1,080km. 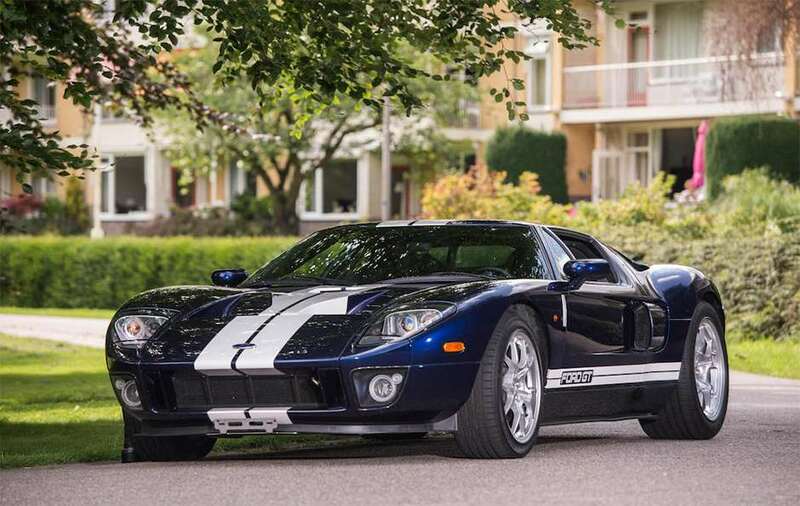 The GT was bought by a Frenchman living in Belgium, who was required to pass a strict vetting procedure by Ford before he was allowed to purchase the car. It was first registered in December 2005 with the plate ‘FGT 094’ and lived with its first owner until 2014, covering around 18,000-miles. Finished in that traditional Ford blue with the white stripes it is described as being in ‘generally excellent condition’. So which to choose? With over 4,000 GTs having been made, and just 275 XJ220s, there’s a chance that the latter is the better option for an investor. With both set to go for similar amounts we can’t decide which to splash the GRR budget on. Can you ..?